Huge Employees are not known how to know our EPFO UAN Status online? The Employees’ Provident Fund Organization (EPFO) had launched to allocate the number of the UAN to all the members of the Provident Fund. After getting the Account Number Universal each and every employee or employer can do the UAN Activation Process and then UAN Download at the official web portal. UAN stands for Universal Account Number allotted by Employee Provident Fund Organization. UAN is a unique 12 digit number which is assigned to the employee by the EPFO office. What is the Purpose of UAN? There are multiple PF IDs allotted to a member by different organizations. UAN will act to combine all these IDs allotted to a single person to a single Universal Account Number. The employee will provide the already available UAN, once he joins a new establishment to link the new PF number to the already generated UAN. This will help in is transfer of one PF accounts of one employer to another without the need of withdrawing the PF amount. Earlier the employees used to be dependent on the employee or the company’s HR to check for the UAN Status. The employer used to provide the employee the Unified account number (UAN) as soon as they get it. The employee used to check with the company’s HR to check for the status of the UAN. But now the process is smoothened by the EPFO and any one can easily check the UAN status. For checking the status of UAN, one needs to have the prerequisite of PAN number, Name as mentioned in the UAN form, Mobile number registered along with the UAN and DoB mentioned on the form. 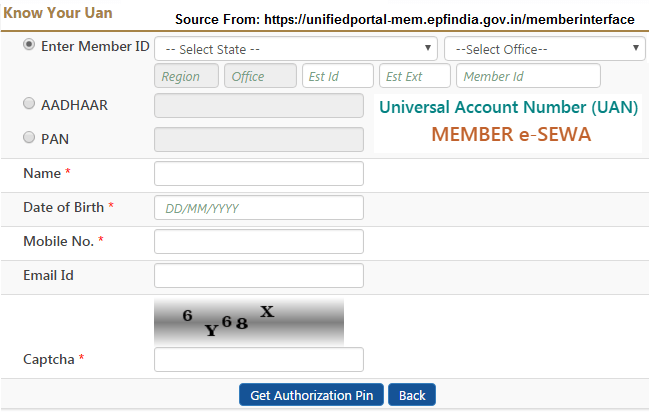 Step 1: Visit Unified EPFO portal: https://unifiedportal-mem.epfindia.gov.in/memberinterface/. There is a link on the right side of the site by the name of “Know your UAN status” click on this link. In the third option you need to enter the PAN card details and some of the personal details like Name, Date of Birth (DoB), Mobile Number, E Mail- ID, and Captcha from the image displayed. Step 3: Validate your mobile number using the OTP received. Once you click on “Get Authorization Pin”, if all the details are correct then an OTP (One time password) is sent to the registered mobile number. Step 4: Get UAN number on the mobile: Once the OTP received in entered. The person will receive the UAN on the mobile number mentioned. If the person already has the UAN number, the person will receive the UAN on the mobile number else if the UAN for some person is yet to be allotted the message will convey the same. Thus, the UAN status check will help in checking if the UAN is updated or not. UAN will help in centralizing the data of the employee at one place by combining the data of different PF numbers. Another advantage is that it reduces the burden of verification from the perspective of an employer and employee and thus makes the procedure free from hassles and for both the parties. UAN has helped EPOFO to collect the bank account details and KYC details without asking the employer. This has helped in reducing the withdrawal of the PF money by the employees due to the hassles involved in transferring money. The Website provides the “UAN download list” of the by entering the Universal Account Number and also the list will be available in the Employer UAN helpdesk. This is the easy procedure to transferring online submission of claims by the members. So to sum up you need UAN for quick as well as easy online transfer of EPF.